During 2019 we are celebrating 175 years at St John's . Below is a list of events and special services. George and the Dragon, a community arts event. Mass of Confirmation by the Bishop of Fulham. Church open day and tours and garden party. Summer Fete with bouncy castle and anniversary raffle draw. 175th Annivervsary Thanksgiving Mass followed by Parish Sunday lunch in the Vicarage garden. Evensong at 5.00pm when the Bishop of London will preach and dedicate the decorative scheme for the shrine of Our Lady of Walsingham. We anticipate the arrival of the six new bells. The date will be posted here when confirmed! There will be a blessing by the Bishop of Fulham on Friday 6th December. The bells will ring on Christmas Day after the 10.00am Mass celebrated by the Bishop of Fulham. The Lay Pastoral Minister at St John's, Anne Abel, was awarded the British Empire Medal by Her Majesty The Queen in the New Year's Birthday Honours. Fr David said he was "thrilled" by Anne's honour. 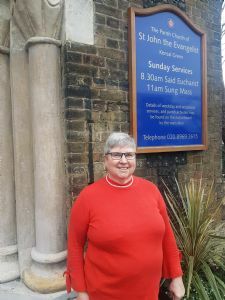 "Anne has worked for many years for three organisations dedicated to St John: St John's Ambulance, the St John's Guild for the Blind and St John's church. At the church she is Pastoral Assistant and served for nearly thirty years as Churchwarden. Her latest role is helping lead our new playgroup. This is a richly deserved honour and we are all so proud of her". Our Anniversary Concert, celebrating 175 years of church life at St John's, took place on Saturday 26th January. The Vaska Quartet provided a programme which was designed to appeal to a family audience. Read more on our CONCERTS page. ll so proud of her". St John's Car Boot Sales take place on the church forecourt on Sundays at 2pm from May through to October - weather permitting! For further information (and if you are interested in running a table) please contact 07459 461192. Children's activity afternoons take place on Saturdays during holidays while Junior Church (Sunday School) is held at 11.00 on Sundays. 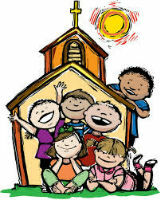 If you are new to St John's and would like your child to attend Junior Church, please speak to Father David. Events Archive - take a look at past events and activities here.